For the last few days I have been trying to put together a post revolving around a magazine I’ve kept since 1991. 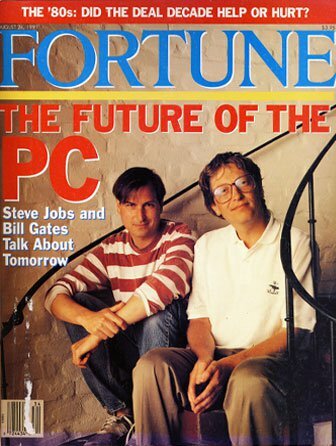 The article is called “The Future of the PC” in Fortune Magazine from August 26, 1991. The article tries to sum up the first ten years of the PC (born 1981) and tries to capture what will happen next. The cover shows very young looking Bill Gates and Steve Jobs sitting next to each other on a circular stairway. At the time, Steve was at NextStep. There was a bit of angst about what was going on with IBM. In general it was a transition time from pre-Internet to Internet era. Unexpectedly, I discovered a recent video interview of Bill Gates and Steve Jobs at the D5 conference sponsored by the Wall Street Journal. It was filmed in 2007 and most likely many of you have already seen it. If you haven’t, and are interested in the workings of the industry, it is a must watch. Between the magazine article and the video interview, a pattern begins to emerge. Bill and Steve have a complex relationship based on what is going on but essentially they are friendly rivals. In the video, it seems evident that there is kind of mutual respect. It is obvious to say that they are very different people with different philosophies as well. Over the years, Bill and Steve have met on stage very few times. In fact, I have only found three instances of public meetings since 1991. The D5 conference last year was the most public and also the most broadcasted on the Internet. From the D5 video you can really get the gist of their relationship. Intelligence is a key factor. Bill and Steve are always trying to up the ante about what they are working on or what they know to be true. It is important for them to be clear about what their vision is and how it will come true. Thought is always at the forefront. The past is a common thread. Bill and Steve have worked together in the past on the Macintosh project. In fact, both have fairly good memories from this time. Perhaps this was true due to Microsoft not being in the GUI space around 1984. It is also important for Bill to mention that they have been and continue to be allies. It seems that they agree on this point but there does seem to be tension still. Obviously Apple wants more of the pie. Apple also believes that it was first and that it deserves more credit for the pioneering work done. If you watch the video, keep in mind that Microsoft and Apple are competitors. Some key messages come across as both try to push their views. Microsoft is trying to be all things to all people. This makes sense from an operating system point of view and even suites like Office. Microsoft thinks that more and more needs to crammed into one device. The philosophy is that more is always better and that more function is key to wider acceptance. Apple, on the other hand, believes in specialization. Apple thinks that the device and software should do one thing really well. This is reflected in new devices like the iPod and iPhone. It could be argued that the iPhone is actually many things in one but the point still remains that the pieces fit well together for what people want instead of the extra baggage they don’t want. This key difference shows the expression of thought of Bill and Steve. Their beliefs have steered the companies they control. Because of this, it would be hard for either company to think the opposite of what they do now. Based on the trends in the market, the pattern is towards specialization. Instead of being a general purpose computer, the model will shift to specific implementations that solve specific needs. This is possible due to more focus on customizing software components to work together much like integrated circuits first changed how electronic components were built. In a way, we are seeing a push back from being so general to being more specific again. The real power comes from having common components (hardware and software) to do it. This has been particularly strong with hardware appliances in the networking business but the idea is spreading quickly to consumer markets. If you don’t need to know how to use a computer to do tasks that are useful, then why not do it? Other benefits come from not being restricted to having a massive hardware requirement for a massive inclusive operating system. Getting back to the topic of Steve and Bill, towards the end of the video they are asked what aspect they envy of each other. Bill responded that he admired Steve’s ability to build the right teams to build the right products. He essentially also wished he had Steve’s taste in things. Steve, on the other hand, wished that he had Bill’s ability to partner with many different companies to build successful products. Obviously both saw these things as weaknesses in themselves relative to the other. There was no sign of hostility to each other like might have been seen when they were much younger. They have aged well and certainly are more wise and mellow than before. There were many quick humorous statements meant to target the other but they both just brushed these remarks off and moved on. The are old enough not to just react. Personally I really enjoyed watching the D5 video because it is a true representation of the history of the industry. These two people have controlled the destiny of two of the most important companies in the computer industry. These are real men with plenty of passion but who also make mistakes from time to time. It is a treat to see this kind of view be so public. In reference to my previous post about the hypothetical entry of Apple into the enterprise market, I must confess that I do not see Steve Jobs going that direction. The obvious exception is any new devices that he can create that are outside the realm of what is now considered a PC. He calls it a post-PC environment and I believe his secret is that he thinks that the era of PCs is coming to a close. Otherwise it would not make sense that he is investing so heavily in specialized devices built on what was learned from the PC era. I hope this catches the attention of a few people. He might very well be right (assuming that he thinks this is true in the first place). Every era must come to an end. Something better than the typical PC is bound to show up eventually. Apple has a good shot on taking that on. The highest chance of success comes from mixing the “Cloud computing” model with the specialized device model. Steve talks about this in relation to Google. It is clear that Steve knows the value of this model and the potential market as well. He gives having maps on the iPhone as an example but it really expands much bigger than that. It is also evident that Bill is more in react mode than innovate mode when it comes to this kind of thinking. In fact, it seemed that Bill is largely staying away from the concept of “Cloud computing” and trying to consolidate the power into the PC as it has been since 1975. Perhaps this is because Bill sees the cloud as a threat and will only invest heavily in things that are known to work well like search. I would end this post by concluding that Steve and Bill are friendly to each other and have even enjoyed time together but that they are still foes when it comes to the companies that they represent. If you watch the video, you will know what I mean. ‹ What Keeps Microsoft Up Late? I also have this mag is it worth any money ??? I doubt it. However, I’ve heard a cover is at the Microsoft museum. Perhaps with enough hype, you could sell it on eBay. A very nice and well researched post. Keep it up!